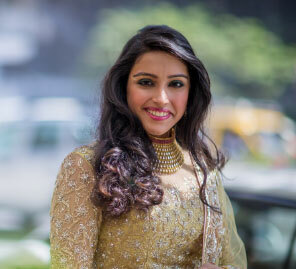 In the second of this three-part series, ‘Ishqbaaaz’ actress and bride-to-be Navina Bole shares her bridal makeover experience which saw her decked out in stylish lehengas at the Neeta Lulla Studio in Mumbai, and transformed into an elegantly modern bride with flawless makeup by Lakme Absolute products crafted by makeup artist Kumar Iyer, hairstyling by Laksh Singh, ornate jewellery from Azva and a candid photo session with photographers Namit and Vipul of Knotty Affair. 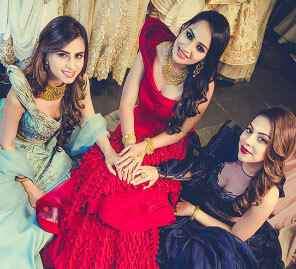 As she is a fashion maven, she dived straight into the wide array of lehengas available at the Neeta Lulla Studio. 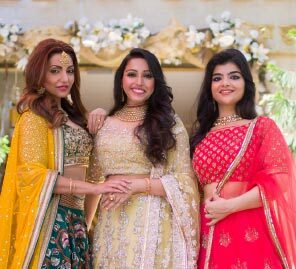 “They were all so beautifully designed and colorful... but I fell in love with an emerald green floral lehenga that had a contrasting yellow dupatta. The intricate floral embroidery and splendid golden border of the dupatta instantly caught my eye,” shares Navina. 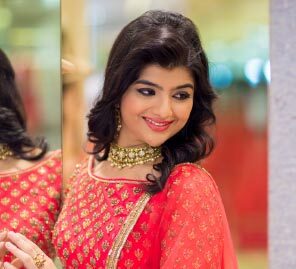 Navina’s look was all about subtle glamor so makeup artist Kumar Iyer started with the Lakmé Absolute Illuminating Foundation to give her face an even flawless finish. He then powdered Navina's face with Lakmé Absolute White Intense Wet and Dry Compact to set and create a smooth base for the rest of her makeup. Since Navina is blessed with beautiful almond-shaped eyes, Kumar accentuated her lids with a combination of Lakmé Absolute Illuminating Eye Shadow in gold shimmer and a touch of Lakmé Absolute Precision Eye Artist Kajal in black. Generous coats of Lakmé Absolute Flutter Secrets Volume Mascara added further dimension and drama to Navina's eyelashes. Kumar skipped the blush completely and with expert strokes added a touch of Lakme Absolute Sunkissed Bronzer to give Navina's face that ethereal illuminated glow. The sensuous look was finished by adding Lakme Absolute Moonlight Highlighter to the high points of Navina's cheekbones and a touch of Lakme Absolute Illuminating Lip Shimmer in Tropical Shine to subtly highlight her lips. Getting married in 2017? Would you like to be a part of WeddingSutra On Location*? Write to us at editor@weddingsutra.com with your name, link to your FB profile and wedding date. Selected winners will receive a complete ‘Bridal Wardrobe’ consultation on how to pick the wedding outfit that perfectly complements your body type and personality.